Hmm, cell phone says it’s Andrew Churchman calling. With the usual pleasantries done, he’s got a situation to discuss. Seems the children of a fellow living in Connecticut are faced with the daunting task of disposing of their father’s print shop in preparation to sell the house. The fellow has been a lifelong letterpresser having amassed a considerable amount of type (reportedly 25+ cabinets!) It all needs to be removed, and soon! Andrew’s situation - he’s in Indianapolis and the logistics of packing and transporting such a large purchase from a distance are very challenging. Have I any thoughts or suggestions. My response - let’s relocate it all to Letterpress Things and have a good ole’ fashioned SWOOP! Thus it began. Andrew flew in, met with the family and crafted an agreement. Andrew and I then worked out details for us to remove the shop’s contents and prepare for a sales event at the store. Now, all that was left to do was. . . move it all! The contents were in a building, once a barn but converted for general use, with one room housing the print shop. There were cabinets, and other stuff, throughout the entire building, including on a second floor once used for hay. The retrieval began on Friday, December 29th. With my son Joe along to help, packing, staging and loading of the van began. The day was bright and sunny, and cold! Minus 11 degrees by the barn thermometer. The Plan - empty the loft through the loft door, many empty cases, four cabinets. The van is filled front to back and to the roof. We start packing “things” in the print shop; cartons of books, paper, loose tools, leads and slugs from their cabinets onto galleys, etc. It all had to go. Day two, Saturday, December 30th, began at 6 a.m., in the dark at Ryder Truck Rental to pick up a 16 footer with a lift gate. As daylight broke it was a bit warmer, about 10 degrees. The sky was deep gray; snow in the forecast. Fortified with extra large cups of Dunkin’ Donut coffee (no heat in the building, by the way), Dave (a longtime associate accustomed to such activity), Joe and myself arrived shortly after 8 a.m. Alas, so did the snow, continuing all day with about five inches of accumulation. The Plan - get it all loaded. 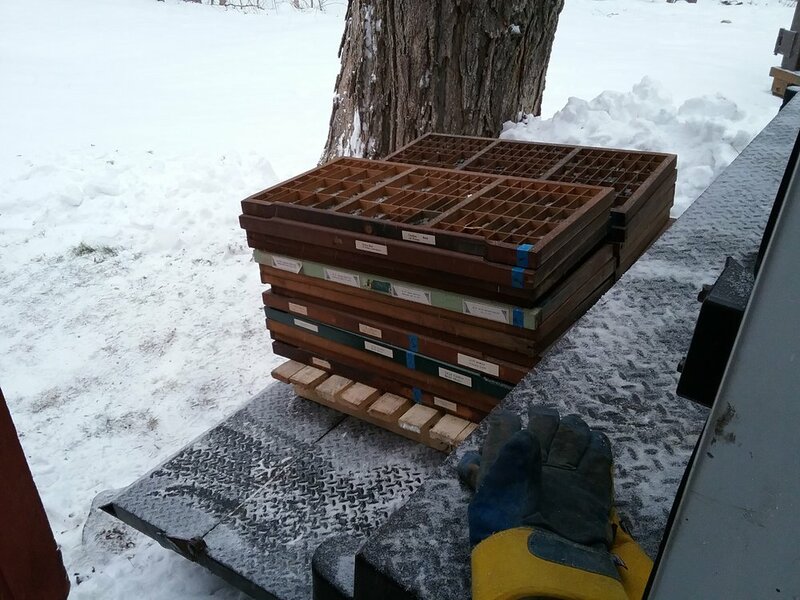 So it began; pull a case, check it’s weigh, slip sideways out the door, shuffle along a snowy path about 50 feet up an embankment, and place the case(s) on a pallet on the lift gate. When full, relocate pallet inside truck. Then the presses; strapped to a two wheeler and dragged up the path, wrestled onto the lift gate, in the snow. After the presses came the cabinets, a couple anyway. The truck is now at weight capacity, so we pile in, head back to Chicopee, off-load and return. It’s now 4 p.m., daylight is waning, the temperature dropping, and there's a lot yet to load. Over the next four hours the remaining cabinets, and dozens of boxes, galleys, and buckets were hauled out, palletized, and shrink wrapped. At about 10:00 p.m., with every last thing in the truck loaded and secured, with tired, aching muscles, and now under the light of a full moon, we drove off to our respective homes for hot showers and bed. Despite it all, there’s an undefinable satisfaction about what’s been accomplished. A labor of love, a love of labor! Day 3, Sunday, December 31st began sunny, bright, and cold. The Plan - off load the second truck load. After a hearty breakfast, and with Dave’s help, the truck was emptied. Over the next few hours everything had to be moved off the dock to the fourth floor. That’s when and where the real planning started. “How do we fit all those cabinets on the floor, keeping floor loading and accessability in mind!” Eventually it all came together. Now it’s time to plan a Swoop! Follow along the next several weeks for details about the Swoop itself. Spending time in the store during the winter is tough. It's cold, dark, and just plain uncomfortable to do anything! But winter's grinding by on the calendar and daylight minutes are on the increase. We've been spending more and more time out on the floor, changing some displays around, processing "things" in from last Fall, and preparing for several events coming up in April. The big project at the moment is getting a No. 11 Golding Pearl readied for sale. Picked it up on very short notice a month ago just as a major snow storm began. It's in need of several parts which have been located, to be installed soon. If you're interested in your very own Pearl, stop in this Saturday to take a look. If a tabletop interests you then come check out a fully ready-to-print 5 x 8 Kelsey. We've got a couple of other units which are being checked over now so stay tuned for updates!